Do you ever wish you could give a few cliff notes to your spouse, parents, in-laws, nanny, or another caretaker on how to maintain a Division of Responsibility when feeding your toddler at meal time? 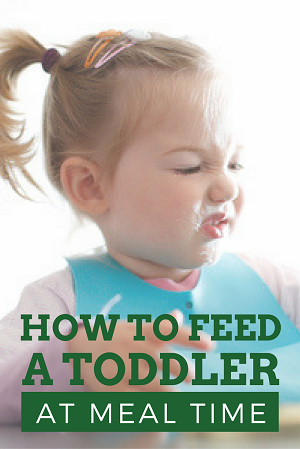 Or maybe after reading through some of my posts on this recommended approach for pediatric feeding like this one or this one, you would like an abridged version yourself for how to handle toddlers at the table. Whoever you want these tidbits for, here you have it! Five tips to avoid power struggles, get your kids the nutrition they need, and stay sane while serving meals to even the pickiest of eaters. 1. Aim to offer at least one of each love it + like it + learning it foods. Include at least one food child loves + at least one food child likes + at least one food child is still learning (to eat and enjoy). Offering such variety encourages children to eat enough to be satisfied while also exposing them to new and/or less-favored foods that they are free to explore and/or enjoy. 2. Focus on nutrient-dense foods first. 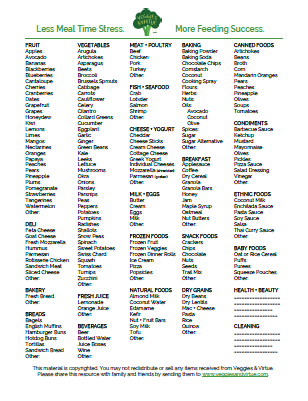 Include a variety from as many food groups as possible. Use a highlighter to mark child’s Love it/Like it/Learning it preferences. 3. At family meal times, pair entrée + sides in a way that accommodates the whole family. You don’t need to please every family member with every food at every meal, and you definitely don’t need to cater to your child’s likes/dislikes any more than another family members. Instead, rotate through individual family member’s favorites accompanying unfamiliar or unfavored entrees with sides that more particular eaters may also enjoy. Consider including a starch or fruit, alongside milk to drink, at family meals also. This way there’s always something to eat if other offerings remain uneaten. 4. Encourage child to build their own plate by serving decomposed dish or offering food family style. A shared meal at the family table is always ideal for fostering healthy eating habits among families. Doing so offers opportunities to expose a variety of foods, while also role modeling how to appropriately explore and enjoy such foods. One way to create appealing and age-appropriate plates with the family is to offer meals as a decomposed dish. This allows children to mix their own meal up or eat items individually based on if they love, like, or are learning the foods being offered. As children over two years old become more comfortable at the dinner table and more confident in their role of determining if and how much to eat, offer meals family style to allow children to serve themselves. 5. In everything, include little ones as much as possible. Give them options from the above food groups that are safe and age-appropriate to explore. As time and patience allows, empower child to engage in meal time preparations by encouraging them to help cut, build, blend, pour, scoop, smear, etc. Role model the desired behaviors, then allow child to practice independent sensory play with the foods at hand! I hope this post helped you go from how to feed using a Division of Responsibility, to also share a bit more about what to feed. If you'd like to see how you can apply this approach for how to feed a toddler at meal times to packing their lunches for the upcoming school year, I invite you to get my FREE download below. It will help you outline all the best ways to fuel your little learner!